190cm tall Calum Von Moger competed at a weight of around 109 kilos. With his height he towered over his opposition. What makes Calum a great champion is not just his size, but also his superb symmetry, wonderful shape, and attention to detail along with his great condition. 2015 WFF Universe was staged by Olivier Ripert in his home city of La Ciotat on the western end of the French Riviera, near Marseille. 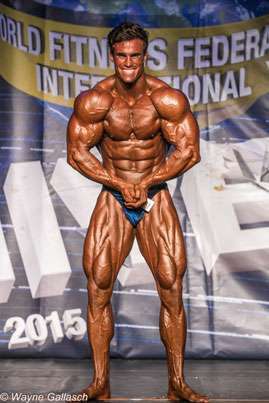 Calum has trained since the age of 15 and is now aged 25. He hails from Geelong in Victoria. He has Austrian and Dutch heritage, and is known in some circles as Arnold #2. In addition, when he speaks with his slight Austrian accent, he even sounds like the young Arnold! It is a great honour for Calum to be compared to Arnold Schwarzenegger, generally regarded by many as the greatest bodybuilder of all time. 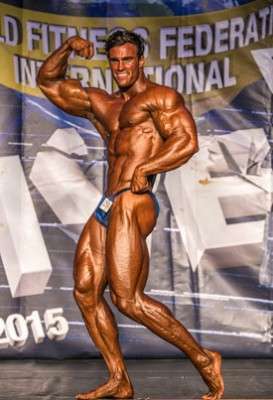 Calum went on to Italy from France and a week later won the Pro title at the 2015 WFF European Championships. He is really on a roll right now and seems unbeatable! In France the 1.9 m tall Calum competed at a weight of around 109 kilos. With his height he towered over his opposition. What makes Calum a great champion is not only his size, but also his superb symmetry, wonderful shape, and attention to detail along with his great condition. A unique characteristic with Calum is the split peak in his biceps. No exercise can develop this special peak, it is initially down to genetics, although hard work is equally important to develop such great arms. For a full report, see Wayne’s Hard News.